Asparagus. One of the few cooked veggies you’re allowed to eat with your fingers. (Also corn on the cob and bacon. Bacon is a veggie, right?) Prep is simple—rinse and snap off the woody part of each stem. Sauté in olive oil or butter over medium-high heat. (Or roast with a coating of olive oil if your oven is already fired up.) Now all you need is salt and pepper. But if you dress it up with some hollandaise sauce or a squeeze of lemon in melted butter, you might want a fork. ~2g net carbs per cup of raw asparagus. Seriously. Give yourself a break and start with prewashed baby spinach. Dump it in a bowl with some toasted walnuts and a few strips of bacon that you diced up and fried until crisp. Vintage cooking means you don’t throw out the bacon fat. Instead, make our yummy bacon vinaigrette. Toss the salad with the warm dressing to gently wilt the spinach. Then serve it up to your adoring fans. A steakhouse favorite, right at your house. Cut a head of iceberg in half, top to bottom, and cut each half into wedges. Remove the stem part from each wedge, rinse, and drain well (so you don’t end up with watery dressing on your plate). Plate the wedges and douse each one with your favorite dressing. Top with crumbled blue cheese (or feta), crispy bacon, and chopped chives, restaurant style. No reservations needed. Silence the haters. Roasted broccoli proves deliciousness and healthy can co-exist. Cut broccoli into medium-sized florets (or buy them pre-prepped). Toss with a generous amount of olive oil—right in the baking dish is fine. Pop into a hot oven and roast for about 20 minutes, or until fork tender. You can sprinkle on sesame seeds you dry roasted in a non-stick skillet, or top with grated cheese, crumbled bacon, or a big pat of butter. It’s all good (for you). Back in the day, you got your field greens from a field. Now you can skip the bugs and dirt, and open up a bag of prewashed baby greens, ready to dump in your salad bowl. Add some fixings. We like cubed feta, halved cherry tomatoes, and pumpkin seeds; you go with your own real-food favorites. Toss with vinaigrette and you’re done. Another night, another salad. The heat is on. Dry sautéed baby kale delivers a mellow, nutty take on “eat your greens.” Using a non-stick skillet over medium-high heat and working in batches, stir a thin layer of kale leaves around until they start to brown, about two minutes. When you finish the whole bunch, turn down the heat, add some butter to the pan, and brown some chopped macadamia (or other) nuts. Toss the nuts with the warm kale and plenty of vinaigrette. What could be cooler? Face it. Purple cabbage is prettier than the green kind. But either will do in this too-easy dish. Cut cabbage stem-to-stern into wedges, removing the tough part of the stem. Place wedges on a roasting pan with a cut-side down, and douse with olive oil. Roast in a hot oven, flipping wedges after about 15 minutes. Brown, crispy edges mean they're ready. Season with salt & pepper, more olive oil, maybe a squeeze of lime, and you’ve got a dish that tastes as good as it looks. Decisions, decisions. Green beans are so easy and basic, you’ll have to figure out how you like them best. If you don’t get the pre-trimmed kind, snip off stem ends. Or not. Now all you need is a hot skillet and some fat. Olive oil. Butter. Ghee. Bacon fat. Pick one. Sauté until beans are just soft and brown. Or cook them less, for more crunch. Top with slivered almonds toasted in butter, or just butter. Not as French; just as delicious. Stand up and take chard! Yes, you can make this rainbow of a veggie the focal point of your plate. Pull off the leaves and chop up the stems. Sauté the stems for a couple of minutes in olive oil. When the stems are lightly browned, tear up the leaves and throw them in too. Stir for a minute—maybe two. Top with shaved parmesan and a drizzle of oil. Add salt and pepper to taste. Keep your peas in the pod and eat the whole damn thing. The more plant parts, the better. We like to cut off the ends, but if that sounds like too much work, just leave ‘em. Sauté in peanut oil, but make it quick—2 minutes, tops. Think wok, but don’t bother buying one. Depending on what else is on the plate, flavor with sesame seeds and a splash of soy sauce, or with salt, pepper and a little crumbled feta. Your mom may not have made this, but we promise you someone else’s mom did. 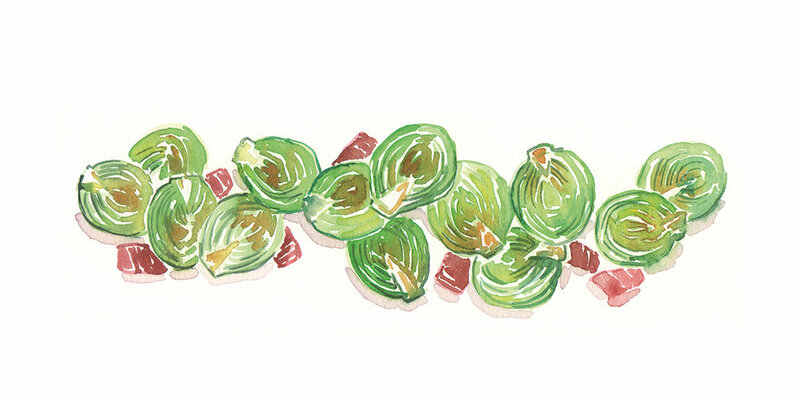 Baby bok choy is easy, tasty and, like all babies, so cute! Slice in half lengthwise, and do your best to rinse off any dirt around the base, but don’t freak out about it. Pan-fry in peanut oil in a hot skillet, about 4 minutes per side. Dress the babies in sesame oil and soy sauce, red pepper flakes if you are feeling feisty. Caesar salad without the fuss. Just clean up the romaine, make sure it is dry, and layer leaves on plate. Top with a creamy dressing and shaved parmesan. Walnuts? Certainly. Bacon? Of course. Parmesan crisps? If you’ve got ‘em. Making it yours makes it even more delicious. Keep your cool with this no-sweat side dish you can make in minutes. Peel your cucumbers as much or as little as you like. Slice them in half, lengthwise. Scoop out the seeds with a spoon or just leave ‘em. Slice your cukes into bite-sized chunks and toss with our creamy dressing and crumbled feta. You might want to add fresh herbs and few sliced bell peppers or cherry tomatoes. You definitely want to add salt and pepper. What could be more chill? Grab a taste of sunshine with this quickie salad. Buy cherry or grape tomatoes (full-size ones work too) and slice them into halves. Arrange on a plate with slices or chunks of fresh mozzarella (the kind bobbing around in water). Pour on olive oil and splash on some red wine vinegar (or balsamic for sweetness, if you are not sugar-sensitive). Top with chopped basil, or other fresh-tasting herb, plus lotsa salt and pepper. Summer lovin’, any time of the year. Kale’s redneck cousin, collards need bacon fat. Pan-fry bacon over medium heat. Remove when crisp, leaving the fat. Rinse collards, remove thick middle rib, and cut leaves into squares. Sauté them with a sprinkle of red pepper flakes until softened, about 5 minutes, stirring often. Add a cup of liquid (chicken broth or water, maybe with a little vinegar). Cover and cook 20 minutes more. Uncover and simmer until tender and only a bit of liquid is left. That potlikker is the best part, y’all. Raab, rabe, rapini. Looks like baby broccoli, but it’s really the European version of turnip greens. The whole thing—leaves, stems, flowers—gets rinsed and tossed with olive oil. You can be fancy and throw in some minced garlic too. Either way, roast it all in a 400°F, until the leaves get a little brown and crispy, about 20 minutes or so. Serve with a sprinkle of red pepper flakes, or a squeeze of lemon, or—of course—a generous pat of butter. Basta with the pasta. Who needs it when there’s zoodles? You can buy ‘em prepped. You can buy ‘em frozen. You can buy zucchini and run it through a spiralizer, which takes literally two minutes and is so much fun it isn’t even fair. Whatever way you go, melt some butter in a pan and sauté your zoodles for a couple of minutes. We like them soft, but not mushy. Some people eat them raw. You are the master of your own zoodles. It’s totally affordable. Crunchy. And everyone forgets that coleslaw is just dressed-up cabbage. So this dish has its own superlative: slawsome. It is so easy to make it delicious. Grate or slice up a head of cabbage, or buy pre-prepped coleslaw mix. Toss with our easy slaw dressing and some chopped herbs. How do you make zucchini that your family will fight over? Try a vintage-style formula our grandmothers deployed: Butter + cheese. Slice zucchini, lengthwise, into ~1⁄4 inch thick planks. Arrange them in buttered baking dish and dot with more butter. Season with salt and pepper, and sprinkle on grated parmesan. Bake at 375°F for 20 minutes, or until zukes are tender and cheese is browned. Sprinkle on chopped herbs, serve, and stand back. This veggie might conjure up memories of soggy green spheres of bitterness, but these are not your mother’s B. sprouts. Give the “cabbage patch kids” a shower, trim off stems and slice 'em in half, lengthwise. Coat with olive oil, season, and place in single layer on baking dish. Roast in hot oven for ~30 minutes, stirring once toward the end. They’re done when well browned, with some crispy leaves. Crumble on bacon and make some new memories.